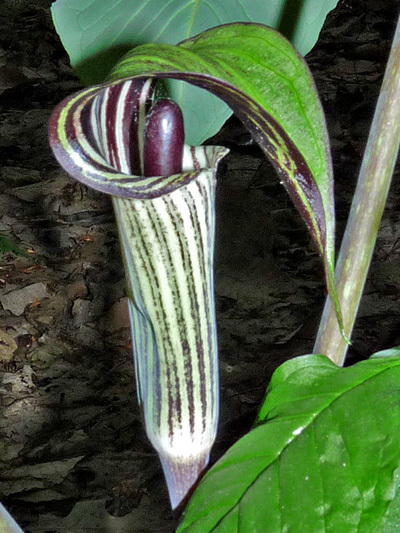 The Arisaema can not be confused with any other species. There are only two American species of Arisaema, the most common being this one, the Jack-in-the-pulpit. The other one, the Green dragon, with a single leaf, is only found on certain islands of the St. Lawrence . The Jack-in-the-pulpit is found in all Southern Quebec. There are three subspecies of the Jack-in-the-pulpit hardly distinguishable from each other. Can cause irritation of the mouth and digestive system, is toxic even lethal if eaten raw. Its two leaves with three leaflets has the same configuration as those of the Poison ivy but the Jack-in-the-pulpit can be handled safely.